The frame is the most important part of your bike, and not all frames are created equal. Frame materials make a big difference in end performance and use of a bike. Here is a quick guide to frame materials. $ High Tensile Steel is less expensive, strong, and sturdy. It is usually found on basic and entry level city bikes and youth bikes. High tensile steel is often heavy. $$$ Aluminum is a light and strong material used in many of our bicycle frames. 6061 is a type of aluminum that is resistant to stress cracking, making it a perfect material to make shaped bike tubes. Aluminum frames are stiffer and lighter than steel. $$$$ Carbon or carbon fiber frames are light, strong, and more resistant to fatigue than aluminum alloys. Carbon is widely considered the best material for bicycle frames on the market. Some people have fears that carbon bikes won’t last as long as other materials, but after 30 years of refinement, those fears has been shown to be a myth. Carbon is the lightest and best-riding bike material. 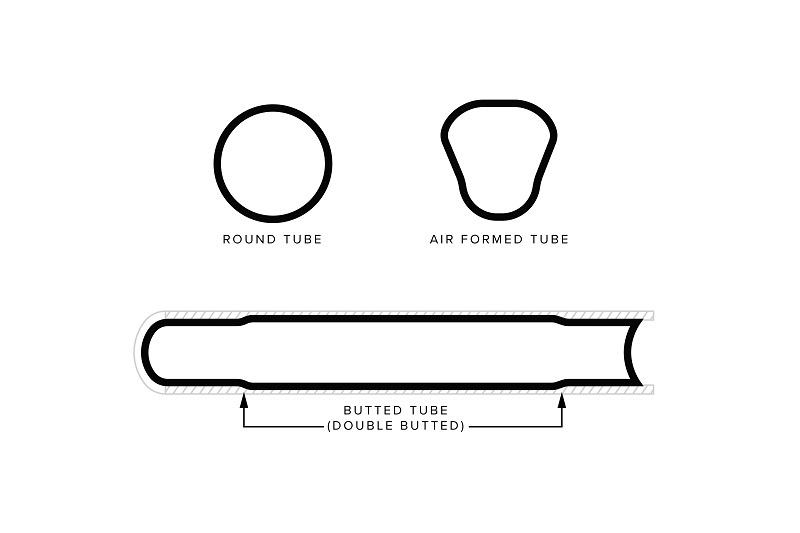 $ Round Tubes are standard circular tubing found on both aluminum and steel bicycles. $$ Formed Tubes are lightweight shaped tubes that are squared. They are structurally stiffer than standard round tubes and add strength and stiffness to important areas of the frame like the front triangle. Often formed tubes are made with aluminum 6061 frames. A formed head tube can handle bigger impacts and will be found on more aggressive mountain bikes. $$$ Butted tubes are thicker at the ends where stress is higher, and thinner at the center. Butting keeps tubes strong and light. Butting is a process that can be applied to aluminum or steel. Double butting means it has two steps of tapering. “Fully butted” means all tubes have butting. $$$$ Carbon AMMP+ is an innovative technology that features advanced monocoque molding. The entire front triangle is built as one piece then stays are joined. This process provides stiff power transfer with a light strong frame and is found on our Airen, Century, and Podium series. $$$$ Unidirectional Carbon is a process where carbon is layered in one direction creating a frame or fork that has less flex. This process makes the stiffest frames and forks, made to win races. This technology is found on many of our performance and race bikes like the Serios. Fender and rack mounts are added to many of our performance, recreational, and entry level bicycles. This is a helpful feature when you want to carry cargo on a rack, rather than with a backpack, or mount fenders to minimize spray from the road on rainy days. Internal Cable Routing, in which cables travel through the inside of the frame, can be found on performance and race mountain bikes and road bikes. Not only does it give your bike a clean look, but it helps with aerodynamics and housing wear. Boost is a new development in mountain bike technology that widens both the front and rear hubs. The resulting spoke angles lead to stiffer wheels in all sizes than in traditionally-spaced hubs and allows for shorter chainstays and wider tires. Boost technology is found on many of our bikes including the Catch series. Geometry is sometimes a difficult thing to sort out. You will find geometry tables of all of our bikes in size guide on each bike model page. Each size and model will have its own geometry. Use the size guide to narrow down what size to look at. Things to look at are stand over which will be your clearance over the top tube, and reach -- the distance from the saddle to the handlebars. 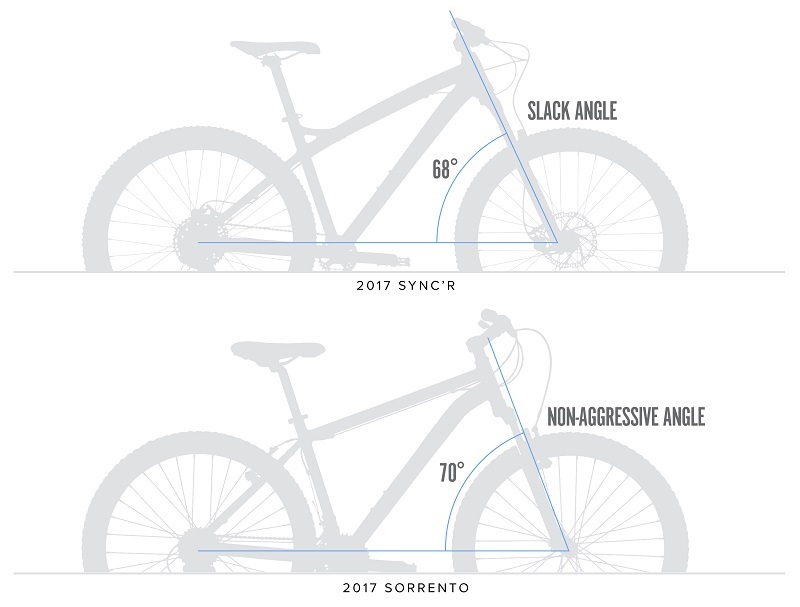 Headtube angle can tell you how steep or slack the head tube is. The higher the number, the steeper the front end. Low numbers, around 68 degrees and below, are called “slack.” Bikes with slack headtubes are intended for more aggressive mountain biking (e.g. the Sync’r). Whereas a headtube angle near 70 degrees would be made for recreational and non-aggressive biking (e.g. the Sorrento). Other factors to think about: where and how will you be riding your bike? How much do you weigh? If you are over the 200-pound mark, you want to buy a bike with higher strength frame material. If money is a factor, the best bang for the buck is aluminum 6061.